Home » Russian facts » Did Russian Parents Scare Their Children with The Story of Baba Yaga? Have you ever listened to scary stories from your parents? Did you make a mistake before hearing the story? Many ways parents do to educate their children. Often, they do it by telling a scary story. Usually it ends with a threat if the child makes another mistake, the character will come to the child. Is that true? If you remember the story of Baba Yaga, the frightening witch. In your opinion, did Russian parents scare their children with the stories of Baba Yaga? Here’s the facts. Children and all their behavior. Many parents sometimes do everything they can to educate their children well. There are many ways that these parents usually do to make their children calm and not make the same mistakes. One method that is often used is to tell scary stories and threaten the children with the characters from the story. There are lots of fairy tales and folklores that have characters with creepy faces, evil characters, and all kinds of other things. Such figures will make children afraid of what figures are in their imagination after hearing stories or threats from their parents. Likewise, with fairy tales and folklore in Russia. Of the many figures, the most famous figure is Baba Yaga. As we know, Baba Yaga is a witch who according to some of the stories is the figure of an evil witch. She lives deep in the forest. She can also fly using a giant mortar and pestle as a rudder. A witch who would kidnap children and eat them. Isn’t this kind of story enough to scare children? Many people seem to wonder. Did Russian parents scare their children with the stories of Baba Yaga? Here’s the facts. Children usually still strongly believe in folklore and fairy tale characters like Baba Yaga. They would certainly imagine the frightening face of Baba Yaga. And Russian parents take advantage of children’s fears to threaten them about what they did wrong. The threat from Russian parents using Baba Yaga is because the witch likes to kidnap children and according to the story the kidnapped children will be taken to her hut. Baba Yaga’s hut is quite frightening for children. Is not it? Russian parents use Baba Yaga to scare their children because she is an ugly and evil old witch from folklore and fairy tales. Baba Yaga is described as having gray hair and very sharp teeth. According to the story, Baba Yaga who was able to fly to kidnap children using giant mortar and pestle as a rudder was very fond of eating the children she had kidnapped. Russian parents will tell about Baba Yaga who really enjoys the taste of children’s meat. The kidnapped children will be cooked and eaten by Baba Yaga in her creepy hut. Children will certainly be afraid to hear the story, right? Many Russian parents use Baba Yaga to threaten their children. They will scare their children with the story of Baba Yaga who lives deep in the forest so they don’t go too far from home when they will play. According to myths or legends, people who enter the forest where Baba Yaga lives will not be able to get out and return home if Baba Yaga catches them. Moreover, there is a story that says if Baba Yaga really likes to kidnap and eat children. Isn’t that terrible? Of course, not all fairy tales and folklore have evil and creepy characters. There are also many fairy tales and folklore that have beautiful or handsome characters with all their kindness. This figure can also be told by parents as a good example to their children. So that children do not think that the characters in fairy tales and folklore are only full of evil and terrible things. So, it is true that there are some people who use the old Russian fairy tales and folklore of Baba Yaga to scare their children not to do bad things. Maybe there are still many things parents say about Baba Yaga that are still used to scare their children. 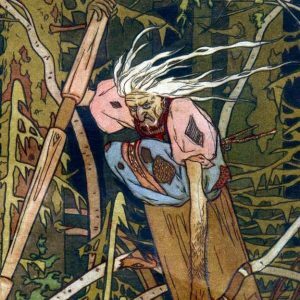 I hope this article can help you find out more about, did Russian parents scare their children with the stories of Baba Yaga?